Former Ute standout walking away after signing FA deal with Broncos following 2018 NFL Draft. Chris Detrick | The Salt Lake Tribune Utah Utes defensive tackle Lowell Lotulelei (93) puts pressure on Colorado Buffaloes quarterback Cade Apsay (15) during the game at Rice-Eccles Stadium Saturday, Nov. 28, 2015. Once considered one of the can’t-miss defensive line talents in college football, Lowell Lotulelei is walking away from the game. The former University of Utah defensive tackle retired from football Monday less than two weeks after signing an undrafted free agent contract with the Denver Broncos. Lotulelei, a four-time All-Pac-12 defensive tackle who started on Utah’s defensive line all four years in school, was waived by the Broncos Monday after informing the team he was done with football after participating in the rookie minicamp. Lotulelei’s agent, Chase Callahan, confirmed the career move Tuesday morning. It’s a somewhat bizarre twist for a player who, just a couple of years ago, was being penciled in potentially as high as a first-round draft pick by some NFL mock drafts. Tony Pauline of DraftAnalyst.com reported Monday that the former Bingham High star intends to pursue a coaching career in football after telling the Broncos of his desire to step away. Mike Klis of 9NEWS in Denver reported that Lotulelei returned the $15,000 signing bonus he received from the Broncos when he relayed his decision. 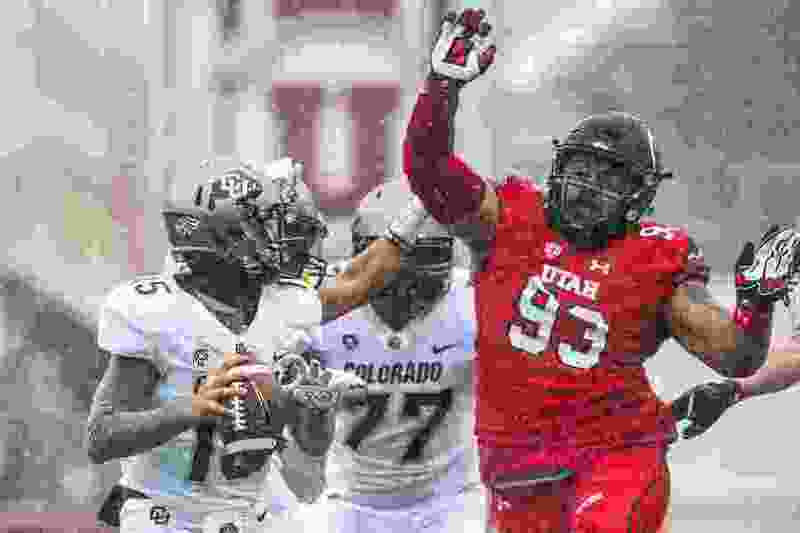 The 6-foot-2, 315-pound tackle wasn’t the same consistent force he was on the inside his last two seasons with the Utes. In 2017, Lotulelei finished as an All-Pac-12 honorable mention, starting all 13 games, but had just 1.5 sacks and 3.5 tackles for loss. He was also voted a team captain on defense. Despite only having one sack in 2015, Lotulelei had his best year as a Ute in nine starts at the left inside tackle position. He earned first-team All-Pac-12 honors as a sophomore. In 2014, Lotulelei was named a first-team freshman All-American by USA Today, finishing with 33 total tackles, 4.5 tackles for loss and four sacks. Lotulelei’s older brother, Star, was also a standout defensive tackle at Bingham and Utah and was drafted 14th by the Carolina Panthers in the 2013 NFL Draft. The Broncos do not have much depth at the inside tackle position, which meant Lowell Lotulelei had a solid chance at making the team’s 53-man roster. There were, however, concerns regarding the former Utah run-stopper entering the draft. On the NFL.com’s prospect page, NFL analyst Lance Zierlein correctly projected Lotulelei to be a priority non-drafted college free agent. Lotulelei has also, it appears, deleted or deactivated his social media accounts on the heels of his shift away from the field.